Every morning brings us news of the globe, and yet we are poor in noteworthy stories. This is because no event comes to us without being already shot through with explanation. In other words, by now almost nothing that happens benefits storytelling; almost everything benefits information. Actually, it is half the art of storytelling to keep a story free from explanation as one reproduces it. . . . The most extraordinary things, marvelous things, are related with the greatest accuracy, but the psychological connection of the event is not forced on the reader. It is left up to him to interpret things the way he understands them, and thus the narrative achieves an amplitude that information lacks. Speakers at Internet Librarian 2011 urge us to watch trends, keep up with them. The urgings are rarely accompanied by rationales. Perhaps this is ideology at work, the moment when attention to trendiness (you can substitute “information” for trendiness) needs no justification. It calls for no one’s assent. What is “trending” on Twitter attracts attention, but it looks as if the game is rigged. From the description in the article, one should be wary about the validity and value of what’s “trending” on Twitter, though CNN, the Huffington Post, and other institutions allegedly devoted to providing information treat trends as news. What we’re seeing is an outcome of a purely algorithmic mechanism, with its built in biases, hence not always intuitive or logical. The algorithm is affected by volume, changes over time, and is customized for every one of the 111 geographic regions chosen by Twitter. According to the author’s article, Twitter has designed its display of results to prevent longevity. Built-in obsolescence does not begin to capture the level of chronos-warping and reality-warping taking place. if one seeks to keep a topic trending, it is important to change it every few days. In an important sense, Twitter decides what is new, and what counts as a new trend, although people who cite what is trending seem to act as if such reports are accurate, important descriptions of what is taking place, information arriving for an audience without interference or bias — mere machine counting. A number of people and entities might benefit from manufacturing trends, and others might suffer from the same manufacturing. Readers might be interested to learn that Walter Benjamin is one of the most frequently cited critics by scholars of literature, history, and translation studies. The quotation above might be viewed as a sign that TFP is following a trend, but please keep in mind that Benjamin’s comment about information is over half a century old. It is likely unnecessary to quantify the attention to trends at the IL2011 conference. 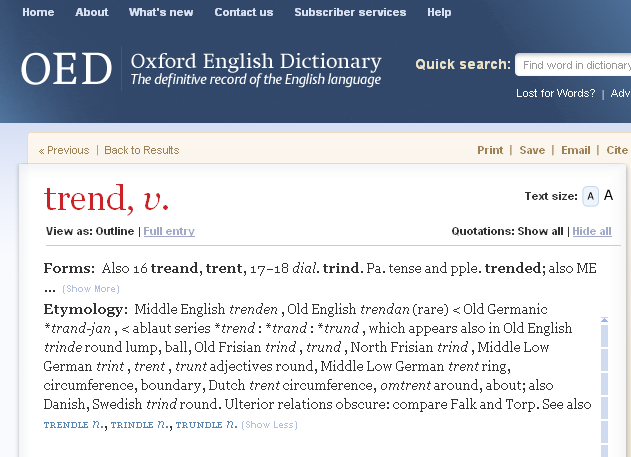 We might want to react to that attention the way one would when hearing the word “lump” from a doctor (see above the etymology of “trend”) — with alarm. This entry was posted in Books, Capitalism, Higher Education, Internet Librarian 2011, Language, Technology, Uncategorized and tagged CNN, Huffington Post, IL2011, trending, trends, Twitter. Bookmark the permalink.